The Black Keys like to take on pet projects. Drummer Patrick Carney has helped produce music by Tennis, while frontman Dan Auerbach has worked on albums by Dr. John and Jessica Lea Mayfield. Auerbach’s current band-of-choice is San Antonio-based fourpiece Hacienda. 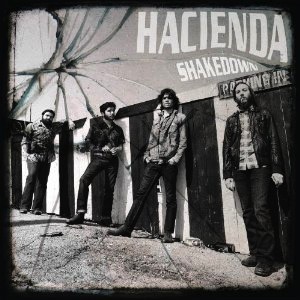 The Texan rockers’ third album definitely contains shades of Brothers, but Shakedown ultimately establishes Hacienda as a unique and solid rock band that’s sure to stick around. Just like their Ohio-bred mentors, Hacienda is stomping, playful, and lyrically less-than-brilliant. Their music is driven not by feeling, but sheer brawn. Shakedown grooves, thumps, and forcefully burrows its way into your skull. Yet in spite of their innovative and infectious rock compositions, Hacienda rarely departs from lyrical clichés. On “You Just Don’t Know,” the band bemoans the pain of love: “The way I feel about you tortures me inside / Never rest til I get this right.” Luckily, excellent and addictive songwriting overshadows the lyrical shortcomings. Standout tracks include first single “Savage” — a laid-back, funky foot-tapper — and “Let Me Go” — a soulful, old-fashioned rock song. Raw, unpolished, and undeniably catchy, the whole album sounds just about radio-ready. Under Auerbach’s excellent direction, Hacienda have produced a solid effort. Musically heavy but lyrically light, Shakedown is an excellent third album.